Image provided by Dr. Justine Sunshine (Vaccine and Infectious Disease Division). In HIV vaccine design, one primary challenge is how to handle the extensive sequence variability in circulating viruses. It is uncertain whether the ability to control viral replication depends more on T-cell responses to a large number of Gag epitope variants, responses to the most highly conserved epitopes, or responses to the most commonly occurring variants. Understanding the nature of Gag-specific T-cell responses that are successful at controlling virus replication would assist in designing effective HIV vaccine strategies. A recent paper from the Dr. Nicole Frahm Lab of the Vaccine and Infectious Disease Division showed that T-cell responses to the most commonly occurring variants contribute more to virologic control than the other factors. The researchers compared the nature of T-cell responses between untreated HIV-infected patients with or without control of virus replication. The researchers tested for T-cell responses (gamma interferon and interleukin-2 FluoroSpot analysis) by cells from the patients using a peptide panel spanning the entire Gag protein. This peptide panel contained all epitopes present in at least 5% of clade B Gag sequence variants in the Los Alamos National Laboratory HIV Sequence Database. Initial analysis revealed similar Gag-specific T-cell responses in HIV controllers and progressors in terms of the number of targeted epitopic regions and the targeting of either conserved or highly variable regions of Gag. Next, the researchers looked at the percent epitope variants in each targeted epitopic region that induced a response. Surprisingly, they found marginally higher levels of epitope variant recognition per epitopic region in virologic progressors than in controllers (p = 0.05). It was also observed that patients whose T-cells recognized more epitope variants had higher viral loads. 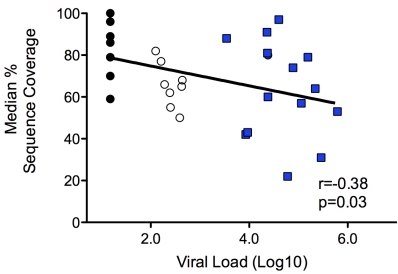 It is possible that the recognition of a larger number of epitope variants could be caused by higher viral loads, which provide more exposure to antigens. Supporting this hypothesis, the initiation of antiretroviral treatment, and thus a reduction in viral load, resulted in a reduction in epitope variant recognition in all 5 subjects put on therapy. Finally, the frequency with which each targeted epitope variant appears in the HIV sequence database provides a method for identifying the most commonly occurring HIV variants that are targeted. The overall proportion of HIV database sequences targeted by a patient's T-cells was defined as the "sequence coverage". Interestingly, sequence coverage was higher in patients with controlled viral replication compared to non-controllers (see figure). This study is highly relevant to HIV vaccine design according to lead author Dr. Justine Sunshine, a postdoctoral fellow in the Frahm Lab. "Several vaccination strategies have been developed to overcome the challenges of the extensive sequence diversity present in circulating HIV populations, including variant-inclusive vaccines designed to increase epitope variant recognition by T cells," she explains. "Our study suggests that it is the ability of T cells to target the most commonly occurring variants ("sequence coverage") rather than simply a large number of variants that contributes to control of viral replication. Thus, sequence coverage may serve as a possible correlate of protection in which to evaluate the protective potential of these new vaccines." Sunshine J, Kim M, Carlson JM, Heckerman D, Czartoski J, Migueles SA, Maenza J, McElrath MJ, Mullins JI, Frahm N. 2014. Increased sequence coverage through combined targeting of variant and conserved epitopes correlates with control of HIV replication. Journal of Virology. 88: 1354-1365.